You can certainly take this idea as far as your heart desires, making torches, hold Opening Ceremonies, etc etc etc, OR keep it bare bones and the kids will love it just the same. Choose two children: one to sit in a chair in front and be the judge, and one to choose a sport. 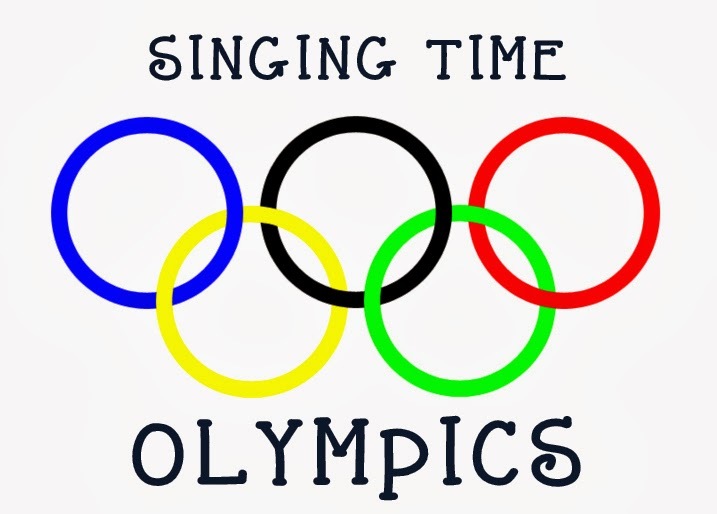 Each sport has a song written on back, and after the kids sing the song, the judge gives their performance a score from 1-10. The judge then gets to pick the next judge and someone to pick the next sport (song). Of course, you could review any songs you like, but because I wanted this to be awesome, we added in a few...variations...of the traditional lyrics. "Spring has brought me such an ICE surprise..."
"I love to SKI the Temple, I'm going there someday..."
"There's a right way to live and PLAY HOCKEY..."
"I will SNOW, I will do, the things the Lord commands..."
"I'll seek the Lord CURLING while in my youth..."
but how many remembered the word changes. or just pass out Go For The Gold rolos dumped into an old peanut butter container. (All the symbols were printed out from a Google image search. You are just too creative!!! Very cool. The rolo's are a really nice touch!! awesome! I love the go for the gold rolos. Thanks. Chocolate is always my favorite part too!